Like the hit series "Pokemon" and "Digimon", the animation series where monsters are up and about for a rampage have always been enjoying overwhelming popularities. 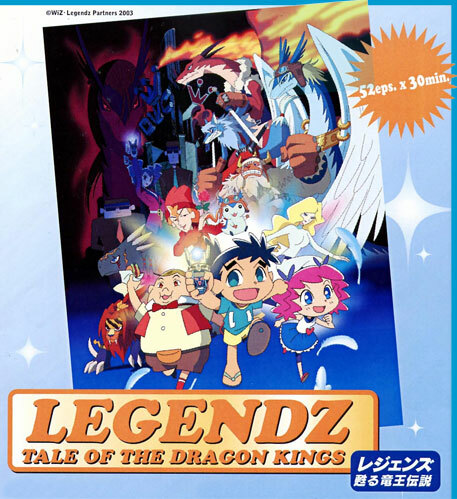 In 2004, Fuji Television proundly presents yet another powerful and fun monster animation - LEGENDZ: TALE OF THE DRAGON KINGS. There has never been any other monster battle animation which is as pop, comical, cute, and full-of-high-speed-gag as Legendz! The monsters we know in stories today actually existed. Long long time ago these creatures, known as Legendz, dominated the planet until one day they all mysteriously disappeared. Now in the 21st century, an evil secret organization is in chase of the school boy Shu for his Talispod, which has a special power to revive Shiron, a legendary Windragon and one of the most powerful Legendz from the toy Soul Dolls. Whereas Shu, not quite knowing why he is being chased by a group of villains, is determined not to release his Talispod. What will Shu's fate be?